These fun party hat cupcakes from Cookies and Cups are the perfect birthday party cupcake. They would also make a fun clown hat cupcake for your circus themed party. They go perfectly with her party hat snack mix. And if you can't find a reason to use them before Christmas, save the link because they can switched up into Santa's hats, just like the party mix. 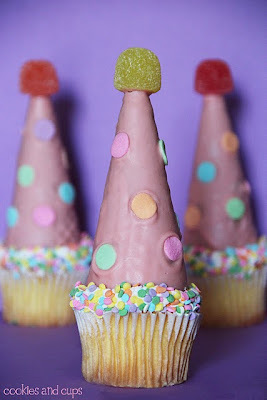 You can see the tutorial for the party hat cupcakes HERE.